I am currently loading Partial View returned by MVC controller to a model dialog via AngularJS $http.get call. My View in rendered properly in modal dialog, but the only problem is that my partial view which is rendered also uses angular expressions etc. and for some reason angular is not working in my partial view, but if i load this partial view in some other view without ajax call then it angular works properly. //other scripts files e.g app.js and angular.js are included in main layout file. Angular Controller to load modal with the partial view. AS you can see from the image below that Angular expressions are not working in Modal Dialog. 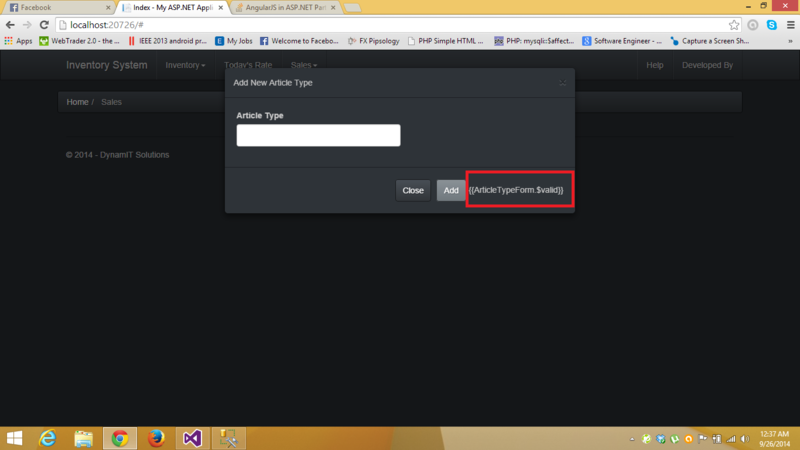 The html of this dialog is returned from MVC Controller whcih returns a partial view. Any help would be really appreciated. Just so that you know, angular expressions etc. are working in normal views. According to your description, it works fine if you load that partial view directly, however it doesn’t work if using the AJAX to load the partial view. I think you may need to compile HTML string or DOM into a template. I have 2 dropdown lists (State and City) in my form and I want to show them as Cascading DropDownList. When I select a State then I want to display only the related cities in that state. I need to solution to show the DDL as Cascading DropDownList. In the above action, we create a list of States and pass them to the view as a ViewBag object. We do NOT return any model to the view. cities associated with the ID and return it back to the View. Once the data is returned, we populate the Cities dropdown list, and then show the dropdown list so it can be visible. between City and State. I’ll let you determine how to use the state’s ID in the action to populate your Cities list. In any case, once you have your list of cities, you return it as a JSON result. That’s all there is to it. This is a complete working solution. Please let me know if you have questions. Thank you very much John for detailed explanation & your solution is working. Can you please let me know how can I make State Dropdown menu field as a Mandatory field and show a client side validation if when the dropdown contains "Select a state" value. or do I need to write any java script?? [RESOLVED]why my helper havent any output after run !!!!!! with multiple foreign keys "JobIds" attached to it? You don’t need to create a link table manually, the EF will create it. For the link table, it doesn’t have the entity field, just the keys of these entities. tables in the sql where created. But How Do I query the information from my project? I went through the JobApi but the data for Customers, ChangeOrders, etc… came back null. To load the related entities, we could use Include method. I have 2 Cascading DropDownLists (State and Cities) . I populate cities when I select a State. In the Cities Dropdown list, the default value is not displayed but all the related Cities are displayed. Can someone please help to populate a default value in Cities Dropdown list? Hope this helps. it’s not tested, but you should catch the idea. [RESOLVED]How comes i cant get my 3 dropdownlist value? But when i try to get the 3 dropdownlist data in my controller it looks like they don’t exist… why? Hi, like this i can see them, but how can i make them as a required fields? La chaîne n'a pas été reconnue en tant que DateTime valide. Détails de l'exception: System.FormatException: La chaîne n'a pas été reconnue en tant que DateTime valide. you should add the three down drown fields to the view model and make them required. I have a Controller called TestController. will want to use those views within other main views later on). I hope my explanation is clear, appreciate any advice. ASP.NET MVC Controllers do not support overloading Controller Actions (e.g. you cannot have two Actions with the same name that expect the same type of request like POST). You obviously don’t need to assign an ActionName to both of them, but at least one will need it in order differentiate between the two. as an AJAX call), then you’ll likely want to include the <form> itself within the Partial Views to avoid any confusion of where to POST to. [RESOLVED]How to use ajax script to prevent from postback view when saving records into the database? Please add a new partial view to display the comment details (e.g. CommentDetail.cshtml). I would suggest you to use MVC ajax, instead of jquery ajax. You are using jquery ajax, which also works but there is some problem in the way you are calling i guess the url, and data are not correct. Hi,I’m having this annoying problemwith datepicker. I’m working with MVC5, Bootstrap, jquery 1.10.2 and jquery-ui-1.11.1. [RESOLVED]Something is triggering unobtrusive validation, but what? Can you send the exact error message you are getting it? As far as i see you don’t have a required field in your model. I finally found the solution, the IdentificationType was a not null int in the DB. I made it nullable in the DB and changed it int he model, now if doesnt trigger the validation.